SLEEVE GASTRECTOMY? WHAT KIND OF SURGERY WILL I UNDERGO? Sleeve gastrectomy is performed with laparoscopic (closed) technique. In the procedure, four to five small incisions, each measuring 1 to 2 cm in length, are made. Contrary to the conventional open surgery, a large incision is not required. First, intraabdominal space is inflated with a harmless gas. A long stick-shaped camera is inserted into the space created in the abdominal space and the images are displayed on the monitor. The surgeon performs the surgery using the stick-like surgical instruments by watching the procedures on the television screen. A large part of the stomach is removed in the laparoscopic sleeve gastrectomy. First, the large left margin of the stomach is separated from the surrounding tissues and organs. After that calibration tube, 13 mm in diameter (39F), is inserted into the mouth and advenced to the stomach, and it is placed such that the tube leans on the right side of the stomach. The calibration tube is used as a guide and the stomach is divided into two pieces on the vertical plane. Small part of the stomach that appears like a tube, measuring 3 cm in diameter, remain at its original place on the right margin. Other part of the stomach that appears like a balloon is removed. A surgical device, also known as endostapler that performs stapling and cutting in an automated manner, is used to division procedure. Endostapler is a tool that appliying multiples small staples in 6 parallel longitudinal rows along a certain line on the stomach. Then it immediately divides the stomach vertically such that 3 lines remain at one side and other 3 lines remain at the other side. So that the division and seperation process are completed for 5 cm. This procedure is repeated 5-6 times in sleeve gastrectomy. About 100 ml metilen blue liquid is pressurized into the reduced stomach through the calibration tube to check for leakage from the staple line. After that the tissue adhesive gel is sprayed onto the tissue along the staple line. Finally a drain, 3-4 mm in diameter, is placed in the abdomen and the operation completed. The time spent in the operating room is approximately two hours, including half an hour for preparations, one hour for the procedure and half an hour for the reanimation. Sleeve gastrectomy is generally performed with closed(laparoscopic) surgical technique, except very rare conditions such as technical problems or complications that require open intervention. 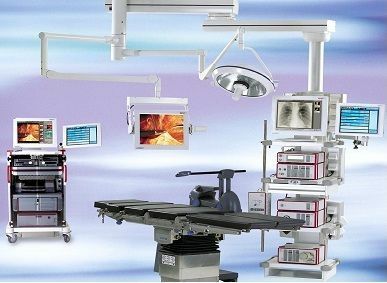 Laparoscopic surgery has many advantages. Those can be listed as less pain, lower risk of infection and hernia, quick postoperative healing and the resultant short hospital stay.